Like little kids, we all experience a happy rush, a delighted thrill, when going to play at an amusement park. Yet when an amusement park is abandoned and an eerie silence settles over the rusty and crusty decay, the setting seems to twist the atmosphere of enthusiastic excitement into a suffocating blanket of dread. The place takes on creepy vibes and freaks people out. In 2005, Hurricane Katrina devastated New Orleans and ripped the heart of fun and the amusement out of this park. Almost six years later, Six Flags in New Orleans is unnaturally silent, no lines and no laughter. This 140-acre surreal setting has morphed into a nightmarish land of twisted dreams. It seems as if the post-apocalyptic atmosphere might be the perfect place to make a zombie movie. As if lured by a distant echo of scattered screams and the ghost of good times, urban explorers venture out of curiosity and capture the moments and crumbling scenes. 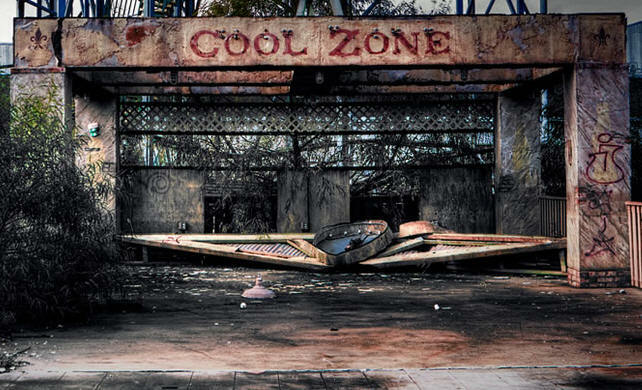 They share with us in a virtual urban exploration tour of this creepy abandoned amusement park – Six Flags New Orleans. Most of these photos are very recent, as in taken during 2011, nearly six years after Hurricane Katrina tried to swallow New Orleans and Six Flags. A special thank you to the urban explorers who risked arrest, and possible zombie attack, to go in and shoot these current shots of Six Flags, and then gave us permission to use their copyright photos. This is about twice the size of a normal post here, so we hope you really enjoy this virtual urban exploration tour into the defunct amusement park Six Flags New Orleans.